“Along the River During the Qingming Festival” (清明上河圖) is a 12th-century painting by Zhang Zeduan. It is often cited as an example of isometric perspective, although the painting in fact skillfully mixes different perspective techniques to produce an overall effect that could never be seen by a single person. The word “isometry” is made of two parts — “iso” meaning “the same” and “metry”, referring to measurement. “Isometric” in this context refers to the fact that the relative sizes of objects are preserved by the representation. The illustration on the left shows how this works: a figure standing close to the viewer (bottom left) isrepresented as the same size as another, further away (top right). This approach is true to one aspect of reality — after all, the two figures really are about the same size. In the Western tradition, perspective developed along different lines, and in a European painting after about 1400 it would be normal to depict the two figures at different sizes, reflecting the fact that distant objects appear smaller than close ones. That represents a different set of choices about what the image will preserve and what it will distort. 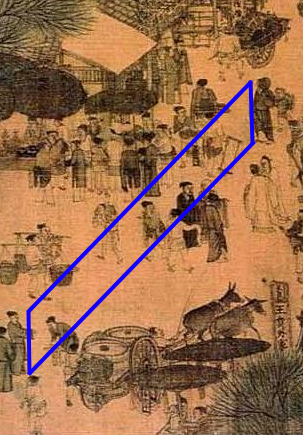 Zhang does in fact use this technique in some of the larger-scale aspects of his composition, meaning the whole image mixes different systems of perspective. This contrasts sharply with the systematic use of perspective that reigned in the West between approximately 1500 and 1800, and that remains the norm in many fields of illustration and computer-generated imagery. Isometry is actually a rather general mathematical concept. The term can apply to any transformation of space that preserves some measure that interests us. Zhang’s isometric perspective transforms a 3D scene (which existed only in his imagination) into a 2D one; this will inevitably destroy or distort some measurable quantities. In this case what’s preserved are the ratios of vertical and horizontal distances. In geometry, we’re sometimes interested only in things we can measure. If so, the isometries that preserve those measurements are known as symmetries: an object that is transformed by an isometry stays “essentially the same” from the viewpoint of that geometry. In plane Eucliean geometry, for instance, all rotations, translations and reflections are isometries. Our Perspective course, which focuses on the conceptual and geometric underpinnings of the most common systems of perspective in the Western tradition, continues for the next seven weeks.